Sky-soaring hip hop sensation, and the street-crowned Limpopo King has announced a reward of $3,000 as Grand Prize in The PullOver Video Contest and this is official. The Grand Prize is for the fan who can best sing his latest single Pull Over ft. Wizkid, record it in a Video, and upload it on YouTUBE. The Contest is open to all fans of all ages all over the world, and which ends October 31, is a reward system for fans who's shown so much love to his person, and his music since he started out a solo career as KCee. 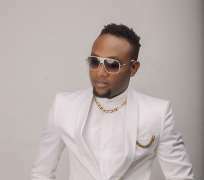 The Contest is also a prelude to the Release of KCee's first Album, which would be released under his record label – 5 Star Music by November 1, 2013. Aside the PullOver Contest, KCee has also announced a Graphic Design Contest for creative graphic Designers in Nigeria who can design the CD Cover for his first Album. 20 Ipads and 15 Samsung Galaxy Phones are available as prizes to the designers. Some of the Ipads and Smartphones will also be used as Consolation Prizes for the Pull-Over Contest. The Contests are supported by MTN, Samsung, and of course 5-Star Music.